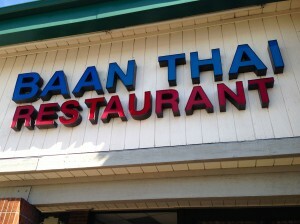 Posted on November 07, 2014 at 9:00:43 am by Sara W.
If you are looking for a restaurant in Fort Wayne to eat Thai food, then look no further than Baan Thai Restaurant, 4634 Coldwater Road, Fort Wayne. Baan Thai, means “House of Thai,” and specializes in Thai food that is fresh, healthy, and cooked to your spice preference (mild to hot). During my visit for lunch, I was impressed with the selection of stir-fries, curries, fried noodles, and vegetarian options. The dinner menu boasts even more items, including specialty entrées, a broad list of appetizers, as well as an array of soups and salads. To begin my meal, I got the Thai iced tea, which is a black Ceylon tea with sweetened milk. It’s delicious and refreshing, but heavy on the cream. It’s a treat that borders on dessert. 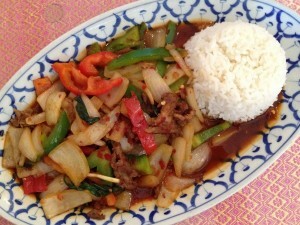 Next, I ordered a beef stir-fry called Pud Kra Prow, which includes bell pepper, onion, and basil in a spicy Thai sauce. Most dishes allow you to choose which meat you prefer: chicken, beef, pork, or tofu (shrimp or squid is $1.00 extra). You will also choose the heat level of your entrée. Entrées that are already spicy (marked with a star on the menu) do not need additional heat unless you like your food extremely spicy. 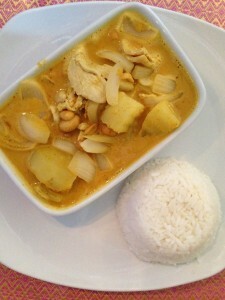 My husband ordered a mild curry called Gang Massaman, which is made with coconut milk, potato, onion, peanuts and your choice of meat. Both lunch orders came with a cup of clear noodle soup as the first course. 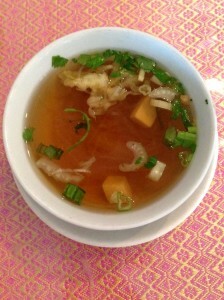 The soup was brothy and flavorful, with a small amount of clear noodles, tofu, cabbage, scallions and cilantro. It was a light addition to the meal before we received our main courses. When the entrées arrived, the beef in my Pud Kra Prow was sliced thin and cooked perfectly. My vegetables were crisp tender with just the right amount of Thai spicy sauce. Since my stir-fry was labeled hot on the menu, I did not add any additional heat to the dish. For those who prefer a milder flavor, this dish is probably too spicy, but for me it was the right amount of heat. My husband’s Gang Massaman with chicken was also perfectly cooked. The sauce was milder than the red Thai sauce on my stir-fry, but was still flavorful with the coconut milk, curry spices, tender potatoes, and peanuts. If you are new to Thai food, I recommend starting with a mild dish, like fried rice or Pad Thai before working your way up to entrées with more heat. My experience at Baan Thai Restaurant was a treat—the food was excellently prepared with fresh vegetables and a blend of delicious spices. Their hours for lunch are Tuesday through Friday 11-2:00, Saturdays 11:30-3:00. Dinner is served Tuesday to Thursday 5:00-9:00 and Friday and Saturday 5:00-9:30. They are closed Sunday and Monday.